Like many of the lifestyle lolitas I love wishes. I wish upon a star, make a wish as I blow out birthday candles, make a wish when I blow the seeds off a dandelions, and wish while throwing a handful of pennies into a wishing well. My grandmother always told me that someone only grows old when they give up on wishes and dreams. Even when I was little I was determined to never grow old. I grew up in household which believed if you make positive and clear wishes you will get what you asked for. Another piece of wisdom from my grandmother was to always keep a wish box. I have had a wish box since I was a child. I found this pretty container in a thrift store when I was about seven. 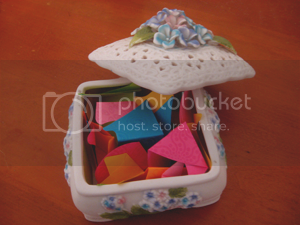 I write my wishes down on decorative paper, fold them up, and store them in my wish box. Whenever I have a new wish I write it down and add it to my container. Once ever six months or so I read through all my wishes so see if any have come true. I have kept some of my old wishes still in my container just because they are adorable. 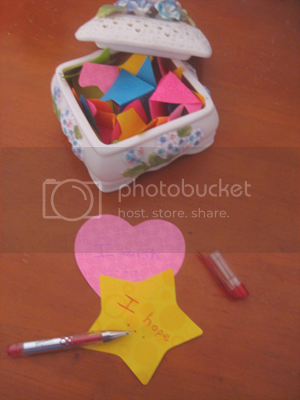 Some of the wishes in my box are for other people as well. You should always keep your wishes and dreams alive. I have a friend that keeps a wish journal. Every line is a wish and as they come true she crosses them off. I think a wish box is cuter though. I had a pleasant surprise not long ago. I recently bought and watched a Taiwanese drama called Fated to Love You. The main character, Xin Yi, also keeps a wish box! She used post-its though. I was really surprised to see one of my family traditions in an Asian drama! What a great idea. I make wishes all the time, and I usually get what I ask for, though I keep them vague so the universe can keep an open mind about the way they are granted. I think I'll start a wish box when I get my room redecorated. Waaah! I LOVE this idea! 8D I'm so totally going to copy this ;D What an amazing idea! Thank you so much for sharing this! AngelShinigami: I believe one must have an open mind with everything in life. I'm glad you liked my little family tradition. Leaa: You're welcome. By all means copy the idea if you like it. I'm glad it inspired you to make your own wish box. Sparklewolfie: A wish necklace would be cute. I'm not a religious jewelry wearer so I would always forget to wear it. It sounds too cute. I don't have a wish box but I write my wishes in my diary as a list and I aleays check them to see what I got. this is a pretty post. Madrepérola: Thank you. You're like my friend with the wish journal. I guess it would be nice to carry that around and check wishes off as them happen. I'm glad to know another wish maker. I have a kind of wish box too, except mine is in a stuffed animal where there's a zipper on its body that I can open up. top secret wish box, haha! Emily: Thank you for visiting my blog! :) A secret wish stuffed animal sounds adorable. Thank you again! Mari ♥: To think that wish boxes were so popular. Thank you! I loved that box the moment I saw it. Check thrift store and antique shops. 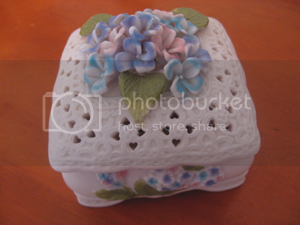 Over the years I have seen plenty of small boxes that would be cute for a wish box. I used to have a wish jar like this when I was little, decorated with ribbons and pearl beads. I should get myself a new one. spiralred: Your jar sounds cute. If you wanted another jar maybe you could find a decorative colored jar. I think that would look cute.